Keeping the deer unaware of your presence when you've got minimal acreage to work with is the key to sustained action. Last october, I found myself with a free evening to hunt. In addition to my buck tag, I had a doe license in my pocket, so I slipped into a stand on a 29-acre property in the Twin Cities. The ever-present drone of traffic on a nearby highway covered up my approach some, and when I settled in I thought there was a chance a doe would make her way through. Since it was the middle of October and the property had never produced much in the way of buck sightings, I wasn’t thinking clearly when he walked in. When I caught sight of the buck walking in, he looked to be all of 130 inches. He was also looking right at me because I’d been careless, and while he didn’t fully spook, he did switch directions and walked out of my life. That encounter reinforced my belief that if you do everything right, good things can happen on small properties. My hunting partner and I are pretty diligent about when we hunt, what conditions we will hunt in, the setups we use, and our overall presence on the property. This keeps the deer more at ease and gives us a better chance for success when sloppier hunting would likely blow out the entire parcel. Whether you’re hunting 15 acres or 40, you still have options. But your success will boil down to using the property wisely. This starts with stands and blinds. I’m generally a treestand guy first, if I can get away with one. So when I find a small-property spot worth hunting, I check out the aerial options before considering a ground blind. For this task, it’s tough to beat The Peak ($130) from Summit. 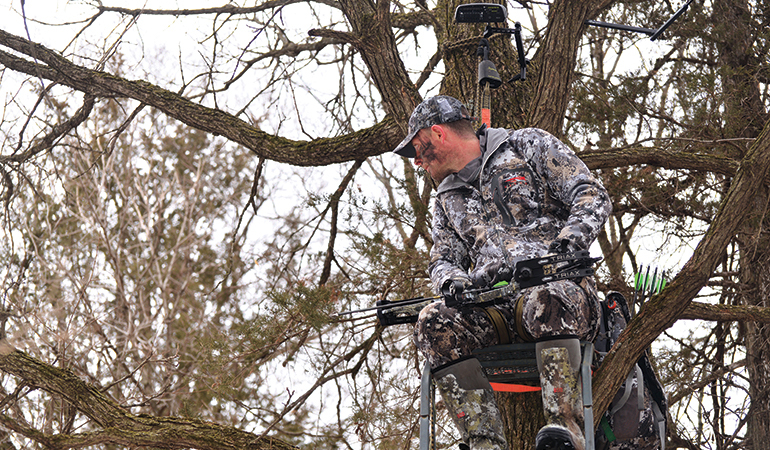 This stand features a foam-padded swing seat with backrest to ensure you’ll be comfortable and move less, which directly equates to fewer deer picking you off. It’s designed with a good-sized platform, and it’s built with durable powder-coated steel for years of safe use. If you’re planning to hunt the cattails, willows, or any low brush that isn’t conducive to a stand, a ground blind is your best bet. This year the SurroundView 360 Blind ($499) from Primos has garnered the most attention in the category, and for good reason. It eliminates blind spots, allowing you to see approaching critters from any direction. A personal favorite in the SurroundView lineup is the 180 ($299), which features two blackout walls and two see-through walls. Ameristep ratcheted their ground-blind game up a level this year with the release of the Distorter ($300). This blind is not shaped like a camo cube, so it blends in really well. It’s also roomy, uses 3D Edge ReLeaf trim to further disappear, and features a Shadowguard interior to keep you from getting spotted. A huge part of keeping action consistent on limited ground involves scent control. If the deer smell you while you’re there, or after you’ve left, you’ve educated them and cut your future chances down considerably. These days, I use a multi-pronged strategy for keeping my scent presence as low as possible. The first step involves treating my clothes with ozone at home in a Scent Crusher Ozone Tote ($250). I simply layer my clothes, harness, and boots in the Ozone Tote and treat them for 30 minutes. The Tote goes into the bed of my pickup, and then once I reach my hunting area I get dressed. Because I’m hypersensitive to entrance and exit routes and the scent I might leave on them, I always wear knee-high rubber boots. In this category, it’s pretty tough to beat the Alphaburly Pro ($180) from LaCrosse Footwear. I like the 800G Optifade Elevated II option, but LaCrosse has plenty of other configurations for your choosing. The main point is they’re crazy comfortable to hike in and can be sprayed down with scent-eliminating spray to add an extra layer of protection to your stealth missions. Rocky Boots has a new knee-high option — the Sport Pro ($120). The 16" Sport Pros are designed with a multi-directional outsole, are waterproof, and feature a polyurethane footbed for extra comfort. They’re also designed with an adjustable locking strap and are covered in Rocky’s Venator camo. A great choice for totally de-scenting your boots is the D/Code Field Spray ($7–$12) from Code Blue. Through the use of medical-grade nanosilver particles, D/Code eliminates up to 99.9% of odor-causing bacteria, meaning it’s the ideal choice for treating your knee-highs and other equipment. Once on stand, the best bet is to stay active with your scent control, and for this task there are very few options. The HR-300 ($450) from Ozonics is an excellent choice given its ozone output and battery life. This year, the company has also released the HR-230 ($350), which is designed to work perfectly with the company’s DRiWASH Gear Bag, Kinetic Pack, and of course, in all of your treestands and ground blinds. When you’re dealing with minimal acreage, you’ll want to know when you should be hunting and when you should be resting your spots. There is no better way to do this than with a great trail camera. One camera I’ve grown to love in the last few years is the Spartan GoCam ($300–$470). They offer quite a few different cameras that work with most wireless carriers, so you don’t need to step into the woods to know what has been browsing past your stand sites. With all wireless cameras I have to offer two caveats. The first is that they aren’t legal everywhere, so check your regs. In other cases, they’re good to go when it comes to scouting in the preseason but can’t be used during the open season. The second caveat is that they are about a thousand times more addictive (and fun) than a normal, non-cellular camera. Stealth Cam has stepped into the cellular game this year with their new GXVRW ($300). This 22MP camera transmits HD photos and videos directly to your mobile device via the Stealth Cam Remote app. The GXVRW also boasts a sub-.5-second trigger speed, and a flash range of up to 100'. The small-property devotee would also be wise to check out Bushnell’s latest, the Impulse Cellular Trail Camera ($299). AT&T and Verizon versions are available on this camera, which features 5-second image recovery, a 100' No Glow Flash, .2-second trigger speed, and sophisticated antitheft technology. Cuddeback has reinvented the way trail cameras work by releasing their new CuddeLink options ($120–$270). This daisy-chained camera system might seem like a big-property dream, but the small-acreage hunter can certainly use it to monitor an entire property while barely having to step foot on it. Multiple cameras can be placed throughout your deer grounds, which will all send images to one home camera. This isn’t a Wi-Fi or cellular system but instead a private camera-to-camera network that’s fee-free and really, really cool. If you’re searching for a killer camera that captures clear images all hours of the day and night, look no further than the Dark Ops Pro XD ($220) from Browning Trail Cameras. This 24MP camera features Dual Camera Lens Technology, which means it sports a lens dedicated to daytime photos, and one for nighttime. It also captures amazing 1080p HD videos (what better way to monitor the rut? ), features a .15-second trigger speed, and is designed with a 1.5" color viewing screen. Anyone on the hunt for a wallet-friendly camera with which to monitor their diminutive patch of deer ground would be well served to check out the Rival 18 Lightsout ($140) from Wildgame Innovations. This camera uses 42 high-intensity invisible LEDs to ensure you’ll get perfect images without spooking antlered passersby. It’s also built with a 90' illumination range, a less-than-.5-second trigger speed, and can capture 720p HD video.